. married Hugh Ellis WYATT. Hugh Ellis WYATT [Parents] was born on 5 Mar 1937 in Decatur, Newton, Mississippi. She died on 1 Aug 1996 in Mobile, Mobile, Alabama. Hugh was married. Jonathan A. BARRETT was born in 1700 in , , Wales. Jonathan married Elizabeth "Betsy" HENDERSON. Elizabeth "Betsy" HENDERSON was born in 1723 in , , Virginia. She was buried in Old Hodge Place, Pacolet River, South Carolina. Elizabeth married Jonathan A. BARRETT. Able BARRETT was born about 1741 in , Rowan, North Carolina. Elizabeth BARRETT was born about 1743 in , Rowan, North Carolina. F iii Bathsheba BARRETT was born in 1745. She died on 22 Aug 1816. Jonathan BARRETT was born in 1747 in , Rowan, North Carolina. Mary Ann BARRETT was born about 1755. Jerusha Elizabeth BARRETT was born on 4 Mar 1761 in Alexander, North Carolina. He died on 14 Mar 1849 in Boone, Indiana. He was buried on 17 Dec 1849 in McClufre Cemetery, Wabash, Indkiana. James Houston KUYKENDALL [Parents] was born in 1826 in , , North Carolina. James married Nancy Lorinda SCALLEY in 1854. Nancy Lorinda SCALLEY [Parents] was born about 1835. Nancy married James Houston KUYKENDALL in 1854. M i Rev. William Hull "Preacher" KUYKENDALL was born on 23 May 1855. He died on 23 May 1942. Rev. 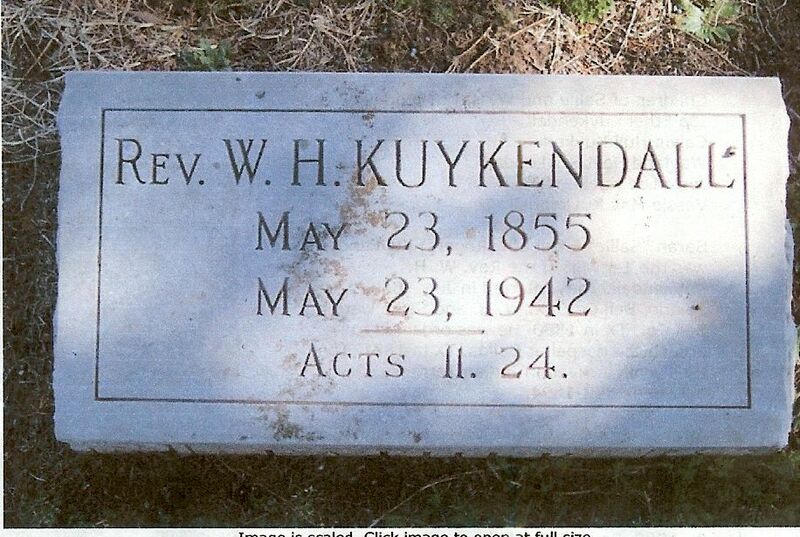 William Hull "Preacher" KUYKENDALL [Parents] was born on 23 May 1855 in , Alcorn, Mississippi. He died on 23 May 1942 in , , Oklahoma. He was buried in Holdenville Cemetery, Holdenville, Hughes, Oklahoma. William married Sarah Elizabeth "Sallie" ROGERS on 27 Jul 1879 in Salado, Bell, Texas. Sarah Elizabeth "Sallie" ROGERS [Parents] was born on 15 Oct 1858 in , , Louisiana. She died on 1 Apr 1896 in , Love, Oklahma. She was buried in Morgan Family Plot, Gordon Cemetery, Marietta, Love, Oklahoma. Sarah married Rev. William Hull "Preacher" KUYKENDALL on 27 Jul 1879 in Salado, Bell, Texas. Ida Ethel KUYKENDALL died in 1954 in Cleburne, Texas. Calvin Hull KUYKENDALL was born on 22 Feb 1885. Wayland Hoyt KUYKENDALL was born on 15 Oct 1889. Josie Lee KUYKENDALL was born on 27 Oct 1892. F i Sarah Elizabeth "Sallie" ROGERS was born on 15 Oct 1858. She died on 1 Apr 1896. Rev. William Hull "Preacher" KUYKENDALL [Parents] was born on 23 May 1855 in , Alcorn, Mississippi. He died on 23 May 1942 in , , Oklahoma. He was buried in Holdenville Cemetery, Holdenville, Hughes, Oklahoma. William married Lillian J..
Lillian J. was born about 1865 in , , Tennessee. Lillian married Rev. William Hull "Preacher" KUYKENDALL. Charles Willis SISLEY [Parents] was born on 10 Oct 1857 in Palo, Linn, Iowa. He died on 1 Sep 1948 in Alliance, Box Butte, Nebraska. Charles married Sarah Elizabeth MUNTZ on 1 Jan 1938 in Alliance, Box Butte, Nebraska. Sarah Elizabeth MUNTZ [Parents] was born on 15 Apr 1868 in , Shelby, Illinois. She died on 7 Feb 1943 in St. Joseph's Hospital, Alliance, Box Butte, Nebraska. She was buried in Alliance, Box Butte, Nebraska. Sarah married Charles Willis SISLEY on 1 Jan 1938 in Alliance, Box Butte, Nebraska. James KUYKENDALL [Parents] was born in 1816 in , Franklin, Tennessee. He died on 29 Mar 1868 in Sorento, Bond, Illinois. He was buried in Kirkland Cemetery, Sorento, Bond, Illinois. James married Narcissa Cristiana CAULK on 20 May 1857 in , Montgomery, Illinois. Narcissa Cristiana CAULK [Parents] was born on 17 Jul 1828 in Rutherford, Tennessee. She died on 26 Mar 1901 in , Bond, Illinois. She was buried in Kirkland Cemetery, Sorento, Bond, Illinois. Narcissa married James KUYKENDALL on 20 May 1857 in , Montgomery, Illinois. M i Francis Marion KUYKENDALL was born on 21 Feb 1858. He died on 30 Sep 1939. 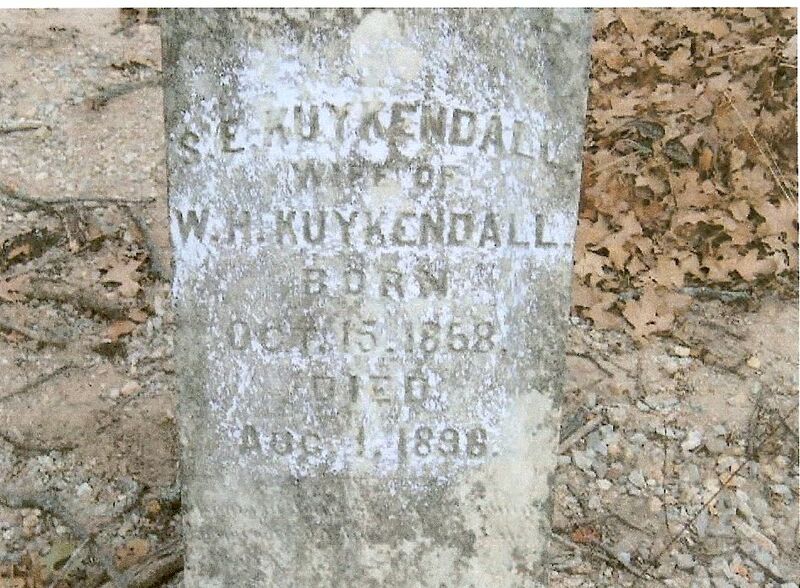 M ii John W. KUYKENDALL was born in 1860. He died on 1 Jun 1945. Abraham KUYKENDALL was born in 1862. Francis Marion KUYKENDALL [Parents] was born on 21 Feb 1858 in Sorento, Bond, Illinois. He died on 30 Sep 1939 in Jacksonville, Morgan, Illinois. Francis married Clarisa Isabel HOLBROOK on 8 Sep 1881 in Cottonwood Grove at Sorento, Bond, Illinois. Clarisa Isabel HOLBROOK was born on 25 Feb 1860 in Sorento, Bond, Illinois. She died on 10 Apr 1925 in Sorento, Bond, Illinois. Clarisa married Francis Marion KUYKENDALL on 8 Sep 1881 in Cottonwood Grove at Sorento, Bond, Illinois. F i Martha KUYKENDALL was born on 1 Oct 1882. F ii Bertha C. KUYKENDALL was born in Sep 1884. She died in 1958. F iii Laura Isbelle KUYKENDALL was born on 26 Oct 1886. She died on 15 Jul 1968. F iv Pearl Burdella KUYKENDALL was born on 15 Feb 1890. She died on 12 Oct 1953. F v Leona Esther KUYKENDALL was born on 13 May 1892. She died on 6 Apr 1933. F vi Anna Melissa KUYKENDALL was born on 12 Jul 1899. She died on 4 Feb 1985. F vii Sadie Arvilla KUYKENDALL was born on 7 Sep 1901. She died in Oct 1973. Henry NOE. Henry married Martha KUYKENDALL on 14 May 1905 in , Bond, Illinois. Martha KUYKENDALL [Parents] was born on 1 Oct 1882 in Sorento, Bond, Illinois. Martha married Henry NOE on 14 May 1905 in , Bond, Illinois.